Gujarat believes that development of infrastructure is pivotal to industrial and economic growth. To facilitate the development of infrastructure there is an elaborate legal and organisational framework. This arrangement is symbolised by the Gujarat Infrastructure Development Board, popularly known as GIDB. 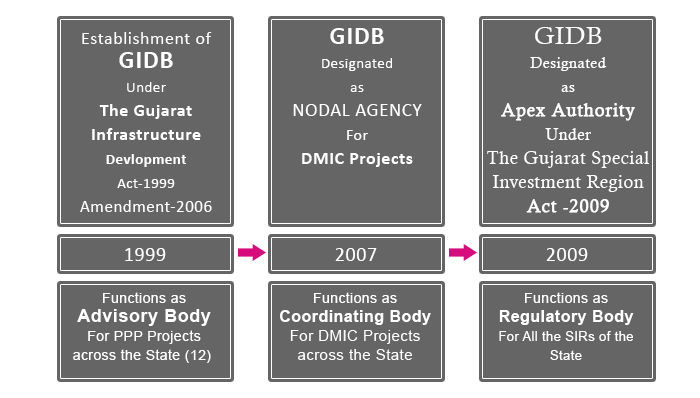 GIDB is a statutory organisation of the Gujarat Government. In 1999, the Gujarat Infrastructure Development (GID) Act was enacted which gives legal framework and roadmap for PPP. GID Act proclaims “competitive bidding” as the preferred mode for developer selection and lays down detailed guidelines However, “Swiss Challenge Route” also recognised to take benefits of innovative ideas and unsolicited projects. In 2006 project award through Direct Negotiation added.